These Medieval Cooking Utensils are historically accurate and shaped correctly. Hand forged, each piece is approximately 9 inches long, the fork tines are approx. 1 1/2 inches wide. The large spoon is perfect for stirring and serving potages and soups. The iron knife is sharpened and quite capable of cutting meats of flesh. 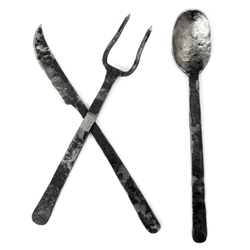 These utensils can also be used for personal flatware and will satisfy the needs of living history groups as well as re-enactors and collectors. Hand Made - Please allow 4-6 weeks for delivery.